The new owners of MetroCenter at South Coast are planning a major renovation project of the office complex, with an expectation of turning the Costa Mesa site into one of Orange County’s most unique office campuses. A venture between Madison, N.J.-based Prudential Real Estate Investors and McCarthy Cook & Co. in Costa Mesa closed on the purchase of MetroCenter late last month. The 17-acre campus, which is just off the San Diego (I-405) Freeway, holds a trio of 12-story offices totaling about 800,000 square feet, as well as a 51,000-square-foot 24 Hour Fitness health club. The property was acquired from an affiliate of San Francisco-based RREEF Funds LLC, which had owned the campus for about a decade. Financial terms of the sale were not immediately disclosed. RREEF paid a reported $261 million for the campus in 2005. It looks as though the latest sale came just in time to be Orange County’s priciest office sale of 2015. A deal approaching the property’s 2005 price would make MetroCenter Orange County’s largest reported office sale of the past year by more than $100 million. The new owners are planning to put substantially more money into the Costa Mesa property over the next year and a half, adding a bevy of creative-office flourishes, extensive outdoor amenities, and other property upgrades on par with those seen at cutting-edge office properties in Silicon Valley, according to Edward Cook, co-president of McCarthy Cook. The redevelopment project is also designed to tie the property into other cutting-edge Costa Mesa properties such as the Lab, the Camp and South Coast Collection retail centers, Cook said. “If we’re on our game, we’ll create a truly unique workplace,” said Cook, who founded the privately held real estate company in 1995 with Tom McCarthy. In addition to its location, MetroCenter— which is on Anton Boulevard and a few blocks from the South Coast Plaza shopping center—has one big thing going for it: size. It is the largest office campus in Orange County that’s not owned by Newport Beachbased developer Irvine Company, according to McCarthy Cook officials. The three offices, which were built in phases between 1984 and 1991, didn’t see too much in the way of upgrades under their prior ownership, and the property has struggled of late in attracting tenants. Its buildings are currently about two-thirds occupied, according to the new owners. Larger tenants at the property include Experian Inc., which has its own headquarters campus next door to MetroCenter, as well as Santa Ana-based Stearns Lending. Monthly rents at the buildings average about $2.60 per square foot, according to McCarthy Cook officials. That’s roughly 25% below what’s charged at other high-end properties in the vicinity, including Irvine Co.’s Pacific Arts Plaza and the Offices at South Coast Plaza, which is run by C.J. Segerstrom & Sons. “Our goal is to narrow that gap” in rents following the redevelopment project, said Brian Harnetiaux, vice president of asset management for McCarthy Cook. The property could be configured to hold a single tenant needing upward of 100,000 square feet of contiguous space, Harnetiaux said. The new ownership group said it has brought on Cushman & Wakefield vice president Mike Coppin to head up leasing for the property, and Megan Allen from the Irvine Co. to manage the property. The new owners also are currently working with architects at the San Diego and Newport Beach offices of Gensler on the new designs for the upgraded property, a renovation project expected to cost well in excess of $10 million, officials said. See-through windows and sliding doors will be added to the first floors of each of the three offices at the property to make those spaces more appealing and promote indoor-outdoor workspaces. It will be the first indoor-outdoor workplace in a high-rise campus setting in Orange County, according to Cook. Underused outdoor patio areas on some of the buildings’ upper floors also will be getting a similar facelift, along with renovations to the buildings’ lobbies, restrooms and elevators. MetroCenter’s outdoor areas will also get a major overhaul, with a dedicated “food truck runway” planned with dedicated power and water stations for the vehicles in order to bring in a revolving cast of food vendors, as well as extensive seating areas for tenants to eat. Also on tap: a 1-mile fitness path that will circle the property and likely be operated in conjunction with the on-site gym, a bikeshare program for tenants, as well as an executive lounge, and shower area in one of the offices. The goal is to get the renovations done by mid-2017. “This is the first time you’ll see a high-rise office (in Orange County) take on a look of a Silicon Valley campus,” Cook said. 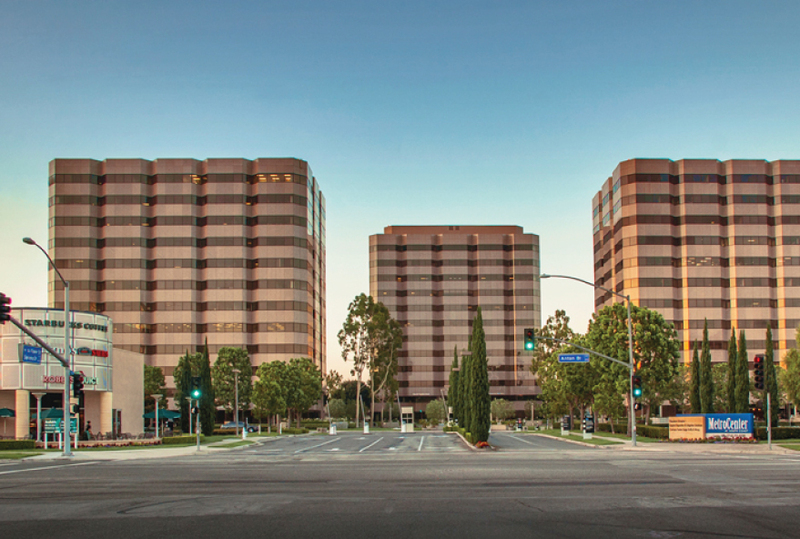 The purchase marks the second notable OC office purchase for Prudential Real Estate Investors in 2015. In August it bought 1301 Dove St., a 202,000-square-foot office in Newport Beach about a mile from John Wayne Airport. McCarthy Cook is acting as that building’s asset manager. The investment division of Newark, N.J.- based Prudential Financial paid nearly $73 million for the Dove Street building, one of several big local office properties bought by insurance companies in 2015. “With projections for outsized employment growth relative to the nation and limited new office construction, we believe Orange County’s office market has considerable room to grow before approaching pre-recession peaks,” said Kevin Smith, head of the Americas at Prudential Real Estate Investors. For McCarthy Cook, the MetroCenter purchase marks a return home of sorts for the real estate owner and developer, which played a large part in the campus’ prior development and entitlement work more than 15 years ago. Among other things, it helped entitle the land next to MetroCenter that was used to build Experian’s 450,000-square-foot campus, as well as a 4.8-acre site on Anton Boulevard next to the office complex that now holds a pair of unused restaurant sites. That land is slated for an upscale rental project called Symphony Apartments. McCarthy Cook was part of the ownership group that sold the MetroCenter offices to RREEF in 2005, but it kept a stake in the 4.8- acre site, whose ownership group also includes Stockbridge Capital Partners in San Francisco and Santa Ana-based Sakioka Co., a longtime area landowner. The 393-unit apartment site—once considered for a high-rise condo tower but now envisioned as a midrise rental project—could begin to see work move ahead next year. The addition of the rental units, combined with the upgrades to the office property, will make MetroCenter a mixed-use campus not too different from Irvine’s Park Place in terms of amenities, Cook said.